Kibale National Park is one of the most accessible of Uganda’s major rain forests offering an excellent environment for chimp tours and bird watching. Found in Kabalore and Kibale districts, the park covers cover 560 square kilometres. Kibale is home to a remarkable 13 primate species, including the much localised red colobus and L’Hoest’s monkeys. Kibale’s major attractive activity is the tracking of habituated Chimpanzees (1,450 chimpanzees registered) closely related to humans than to any other living creature are good to watch as they squabble and play in fruitful trees. 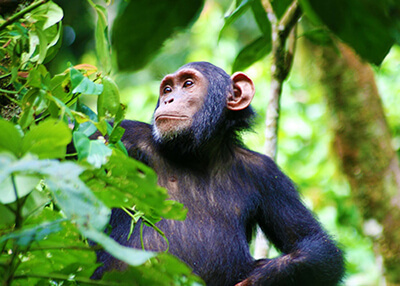 Chimpanzee Safaris in Kibale National Park are done mainly in the morning and afternoon and always supplemented with a tour of Bigodi Wetland Sanctuary commonly known as Bigodi Swamp Walk. A line of shady forest trails provides much to delight botanists and butterfly lovers, while birders are in for a treat with 335 species recorded including the endemic Prirogrine’s ground thrush. There are also 4 species recorded nowhere else in Ugandan national parks: Nahan’s Francolin, blue-headed bee-eater, masked Apalis, and Cassin’s Spine-tail. Other bird species are the Red-winged Francolin, White-naped pigeon, Green-breasted Pitta, Abyssinian Ground Thrush, White-bellied Fly-catcher, Red-chested Fluff-tail, Uganda woodland Warbler, Chestnut-winged Starling, Tiny Sunbirds, Joyful Greenbul, Petit’s Cuckoo-Shrike, Grey-winged Robin, and Grey-headed Olive-back. Kibale National Park got that National Park status in 1993 has at least 60 registered mammal species. Among these include elephants, buffaloes, bush pigs, duikers and bats. The nine diurnal primates present in Kibale Forest include vervet, black and white colobus, vervet monkeys, olive baboon, and chimpanzees. The elusive forest elephant, smaller and hairier than its Savannah counterpart, moves seasonally into the developed part of the park, while other terrestrial animals like the buffalo, giant forest hog and a half dozen antelope species. Kibale is mainly inhabited by Batooro and Bakiga traditionally both tribes used the forest for food, fuel, building materials and medicines. This walk by tourists starts from Kanyanchu River Camp in the morning at 8.00 am or afternoon at 3.00 pm. It’s an interesting walk that lasts 2 – 4 hours. This primate walk enables you to see a different plant and animal species in the forest. Four groups of four visitors are entertainment in the morning and a similar group size in the afternoon. This concept of Chimpanzee Habituation Experience focuses on de-sensitizing chimpanzees to human presence while maintaining their natural behaviour. During habituation process, one sees chimps getting-out of the nests between 5.30 am and 6.30 am and keeps follow-up to when building nests for their sleeping between 6.30 pm and 7.30 pm in the evening. Habituation starts from Kanyanchu River Camp. The hiking of 12 km is mainly done during the dry seasons that run from November to February and June to September and gives a visiting opportunity to the diverse park sanctuaries like the tropical rain forest, grassland, swamp and riverine forest. Walking usually starts at 8.00 am up to when elephant wallow around 2.00 pm. This hiking exposes you to many primates and birds. Taking packed lunch is good for this hike. Those that need adventuring and maximally enjoy the Forest’s wildlife, a 63 km guide walk from either Sebitoli or Kanyanchu and end at either site as you walk for 2 – 6 days through various sanctuaries and community campsites at Nyakarongo, Nyaibanda and Kinoni where you will enjoy traditional dance and offered local food dishes is quite rewarding. Indeed, it is worth a walk. This is a thrilling trek at night into the forest to look for nocturnal animals. While in Kibale, you can visit Bigodi Wetland for an amazing admiration of nature, birding and watching of more primate species. Bigodi Wetland Sanctuary is a captivating area in Magombe swamp with an collection of biodiversity like quite a lot of primates species including the baboon, red colobus monkey, blue monkey grey cheeked, mangabey, black & white colobus monkey, red tailed monkey, vervet monkey and the L’Hoest monkey. Other Mammals are chimpanzees, mongooses, Sitatunga, bush pigs, otters and bush bucks which as pay visit to this swamp from the nearby Kibale National Park. Primate Lodge Kibale – located in the middle of the forest at where the chimp tracking commences from, it has charming restaurant, bar and fire place for pleasant evenings. Preparations for modern bandas, luxury tents and a comfortable Sky Tree House are underway. Kanyanchu River Camp- excellent accommodation for visitors who stay in the Sky Tree House overlooking the spectacular elephant wallow. The Sky Tree House accommodates 2 people only. Sebitoli Forest Centre – this one has a capacity of 11 beds (2 doubles, 3 singles and 2 twins). Mantana Luxury Tented Camp – in the middle of the forest, it’s a bush type comfortable accommodation. Ndali Lodge a luxury accommodation with thatched cottages overlooking a crater lake. Budget lodges at Bigodi, the crater lakes; an observation tower and a boardwalk that traverses the papyrus beds. The path and boardwalk may be flooded and muddy after heavy rain and gumboots are recommended. They can be hired at the visitor centre. The walk is about 4 km in length, taking 3-4 hours at birding pace. With all proceeds from eco-tourism going back into the community, this is a conservation project well worth supporting. Drive from Kampala to Fort Portal (320 kms) then take a road to Kamwenge that commences from near the bridge over the Mpanga River in Fort Portal and is well signposted. Drive turning to left at the junction 12 km from Fort Portal and read the signpost for another 24 km drive to Kanyanchu Tourist Centre. Please note that his is not a Zoo so it is a tropical rain forest and sightings depend on factors such as time of the day fruit availability, weather and how quite the primate group is.